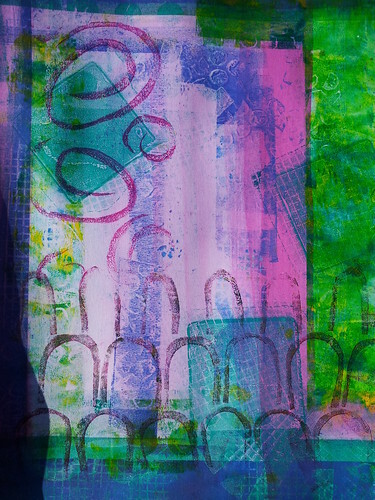 The Journal Junkie: Gelli Arts Gel Printing Plate! 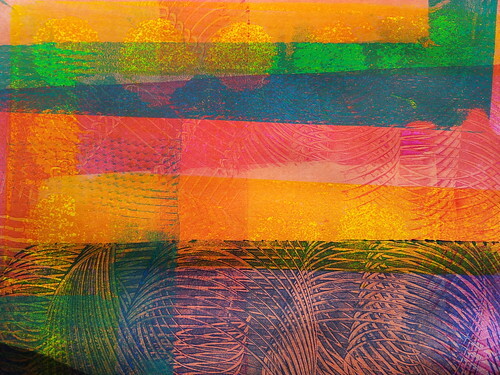 Gelli Arts Gel Printing Plate! 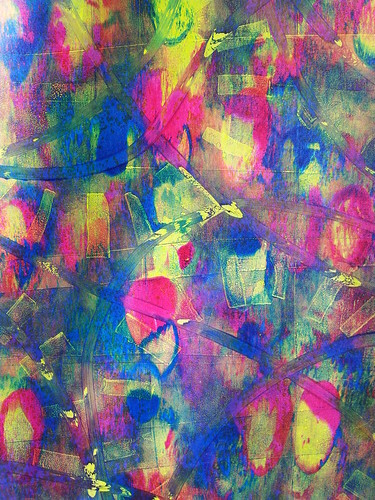 Santa brought me a great new art tool, a Gelli Arts Gel Printing Plate. This thing is awesome! In two days I've already spent several hours playing with it. My other art tools are jealous. Below are a few pictures of the tools and supplies I've been using as well as some of my initial results. Can't wait to see where this is headed. I have the largest gel plate. It allows me lots of room to play and decide where I want to place my paper for a full bleed print. I can then use the rest for smaller elements, borders, etc. on the same print or start another. 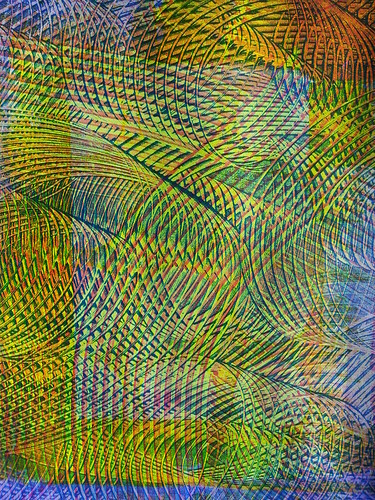 I am finding that one plate full of paint easily covers 3-4 prints (1-2 full and 1-2 partial). I picked up a couple of Martha Stewart combs and these were a great addition to my art tools. I'm also having fun using homemade stamps and other found items. For example, I saved all of the card stock out of my son's new board games (they make for some pretty cool stencils). An end cap from an empty roll of cling wrap works pretty well as a writing/drawing tip. 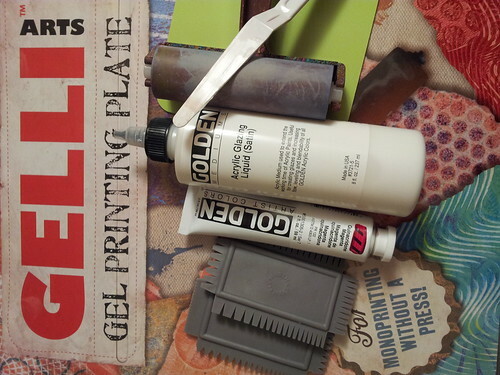 What tools (store bought, homemade, or found) are you using with your gel printing plate? 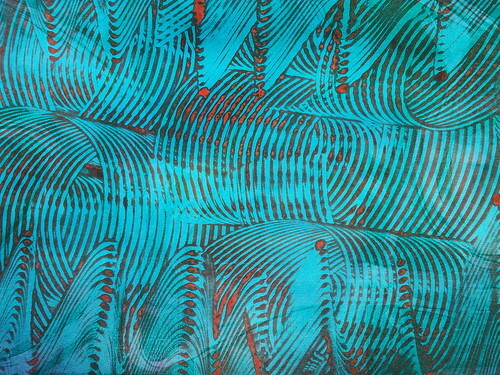 I have the big Gelli too- and love it for all the same reasons you listed. It is such an addictive thing! 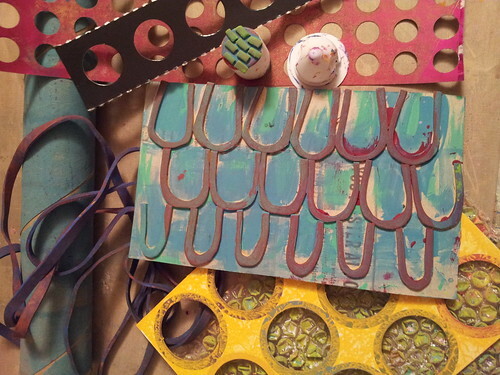 My favorite homemade tool right now is lace and corrugated cardboard- they may such great lines and details. My favorite is the rainbow of colors print 2nd from the last! Carolyn thanks for you encouraging words. Have loved following the party. You are quite the event planner!